In his professional life, Abhishek Gattani started a company that specialized in predicting behavior patterns in people using automated intelligence and other machine learning. But in his personal life, Gattani repeatedly engaged in abusive and erratic behavior towards his wife, former Apple software engineer Neha Rastogi, according to digital recordings and witness accounts that were part of criminal proceedings against him. The former CEO of Cuberon (he was fired earlier this year after reports of his alleged abuse were made public), Gattani will serve 13 days in jail -- a sentence that victim rights advocates describe as far too lenient. 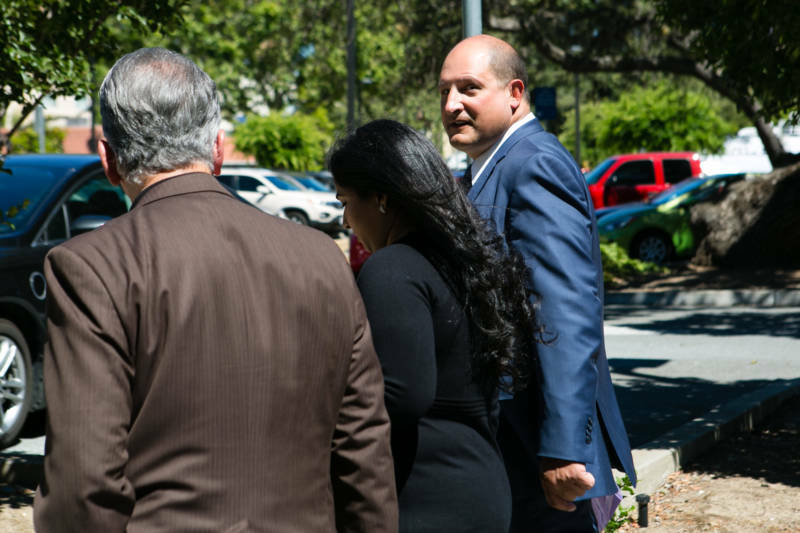 On Thursday, Gattani was sentenced by a Palo Alto judge to 30 days in jail in accordance to a plea agreement reached with the Santa Clara District Attorney's office. After counting time served and other factors, Gattani will spend 13 nights in custody. 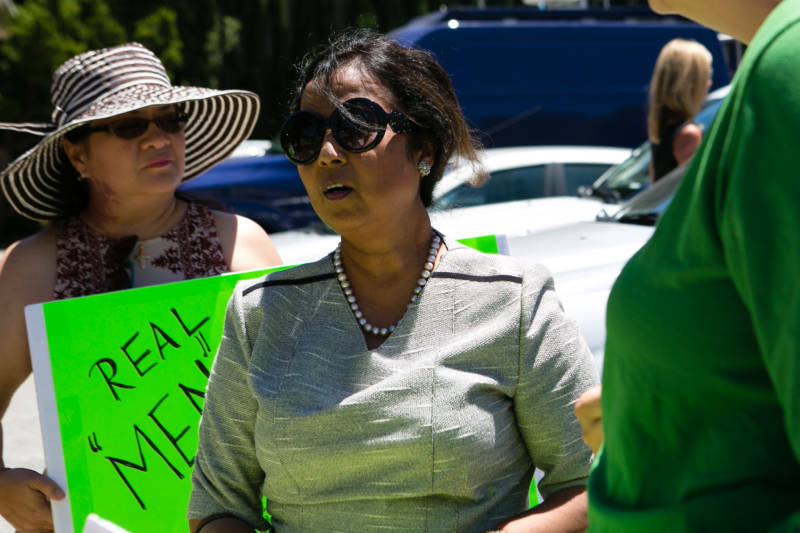 Across the street from the courthouse, about a dozen victims’ rights advocates gathered to show their support for Rastogi and draw attention to the wider issue of domestic violence. 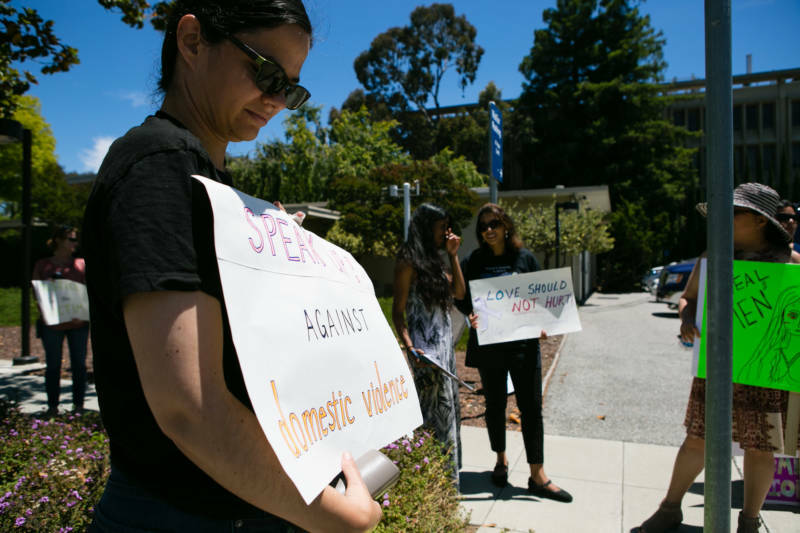 “Domestic violence isn’t a problem with just one culture,” said Karla Nema of San Jose. 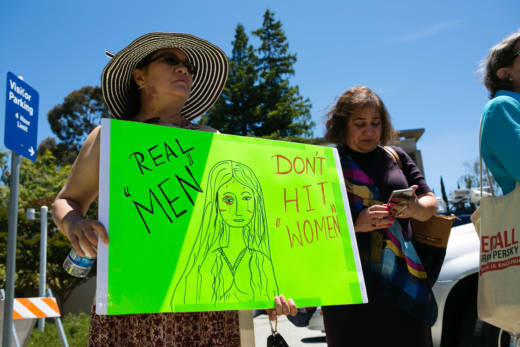 She carried a sign that said, “Real Men Don’t Hit Women,” with a drawing of a woman whose face was covered with cuts and bruises. Court documents and audio recordings indicate that Gattani bullied, berated and battered his wife for several years. She made audio recordings of her husband slapping her as he asked her questions about a software bug. Rastogi can be heard begging her husband of 11 years to stop hitting her. The audio surfaced after Gattani made the plea agreement with Santa Clara prosecutors. Angry at what she felt was a light sentence, Rastogi made the recordings of her abuse public, and soon they were published by The Daily Beast. Since then, there's been a barrage of criticism towards Santa Clara District Attorney Jeffrey Rosen -- that he gave Gattani a soft deal. Critics of the verdict -- such as Michele Dauber of Stanford -- note this deal was reached in the same courthouse where convicted sexual batterer Brock Turner was sentenced to what many consider a lenient punishment. The assistant district attorney who prosecuted the case refuted those criticisms, saying that the victim's statements would make the case difficult to try. "It's a high standard of proof," Santa Clara County prosecutor Brian Welch said. "We have to ask ourselves, 'What's a defense attorney going to do?'" Welch wrote a memo to the court justifying the sentencing agreement after Rastogi went public with her tapes. He told KQED that the inconsistencies in Rastogi's statements to authorities over the years would make it easy for the defense to create reasonable doubt in the minds of jury members. For example, at one point a mailman saw Gattani repeatedly punch Rastogi in the ribs as the couple walked out of their house. At first, the battered wife acknowledged Gattani's abuse, confirming it to police. Later -- after Gattani returned to the home -- Rastogi recanted that claim, saying her husband was striking her to help "alleviate her acid reflux," according to court documents. Later in the memo, Welch notes that Rastogi withdrew more than $943,600 from the couple's bank account shortly before going to authorities to report the abuse. "Ms. Rastogi and (Gattani) are embroiled in a contentious divorce and custody battle, which gives her motive to embellish the domestic violence and its impact on their daughter," Welch wrote in the memo. "I stand by the memo," Welch told KQED. "If I wrote it more generically, the court would not be in the position to evaluate that argument. I agree that the tapes are disturbing. The recording influenced us to initially pursue this as a felony. But we had to take into consideration a host of factors." Yet, Dauber -- who criticized the Santa Clara justice system after the Brock Turner case -- said the memo made it impossible for the judge to reconsider the sentencing agreement. "You don't have to lay everything out and do the defense's job for them," Dauber said. "I'm not saying that a better outcome would have come in court. I am saying we'll never know, because after that memo, what else could the judge do? (Gattani's) defense was laid out by the D.A."